FLORENCE NIGHTINGALE Autograph Envelope Signed. British (English) pioneer nurse and social reformer. "The Lady with the Lamp". 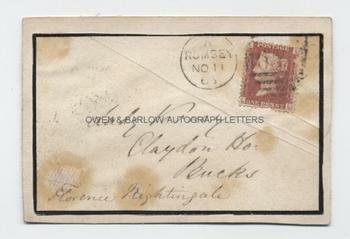 Envelope addressed in her hand to her sister "Lady Verney, Claydon Ho[use], Bucks" and signed at lower left. Postmarked Romsey 1865. Measuring approx. 4 x 2.5 inches. 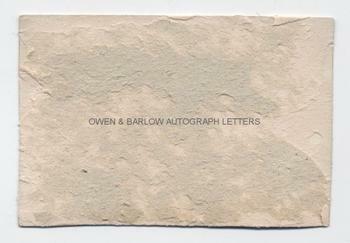 Laid down on card with some old browning from the glue used to affix it and with mounting residue on the verso. Good. Lady Frances Parthenope Verney, nee Nightingale (1819-1890), was Florence Nightingale's elder sister. Florence had previously had a romantic involvement with Sir Harry Verney and it was she who introduced her sister to him. Lady Verney had initially opposed her sister's involvement in nursing but during the Crimean war she became an active supporter of Florence's work. Lady Verney made her own reputation as an author and journalist.